Charles Schulz’s comic strip Peanuts, gave birth to Charlie Brown and his dog Snoopy, which can both be seen at the box-office, starring in “The Peanuts Movie”. But, more important than Snoopy going Hollywood is his association to Omega watches, NASA and the Apollo mission that took humankind towards the moon. 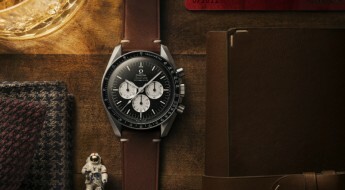 This year marks the 45th anniversary of the Apollo 13 mission and Omega has issued a new time piece to highlight the occasion. The Silver Snoopy Award was created by NASA to honor those that contribute to outstanding achievements related to human flight safety or mission success. After the Apollo 1 fire, NASA had to rebuild their tarnished Apollo programs image. So, when Charles Schulz an avid supporter of the U.S. space program was approached to allow Snoopy to be their safety mascot. He not only agreed to allow Snoopy become an astronaut, but he did it at no cost, assuming a patriotic stance. Schulz also drew the image for the award pin, as well as promotional art to promote the award program. 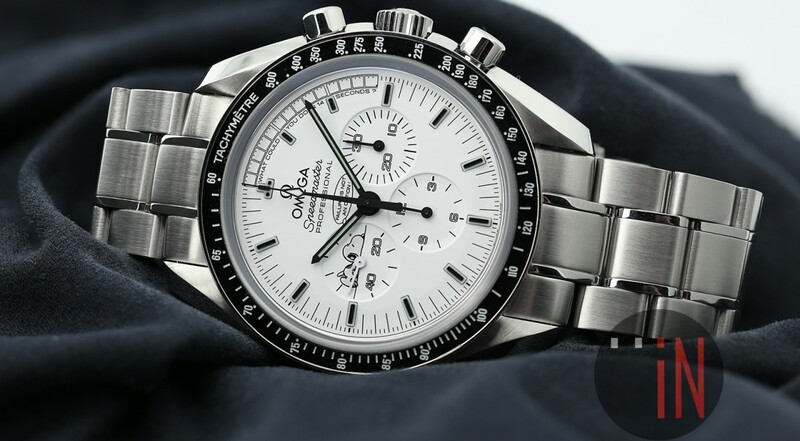 Although black and white is a color scheme often seen on watches, there aren’t many Speedmaster with white dials. 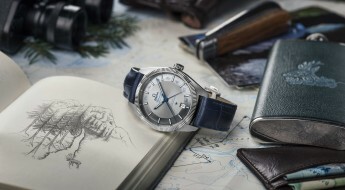 Their use on this new Omega is intended to recall the Peanuts comic strips printed in newspapers. 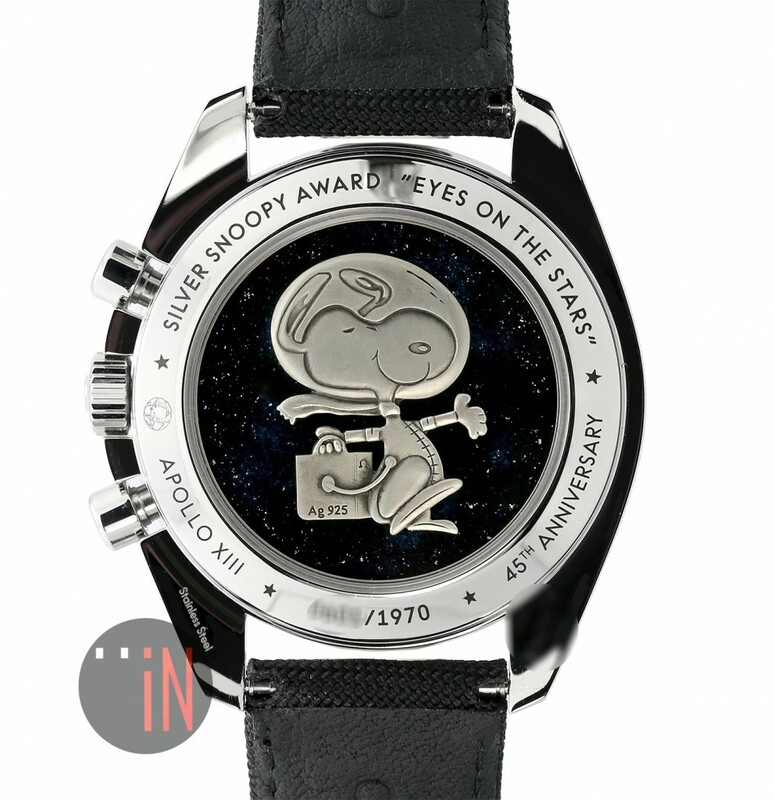 The “Speedmaster Apollo 13 Silver Snoopy Award” features a white dial with black varnished hands. There are three sub-dials: a 30m counter & 12 hour counter both with a black hand; and a second’s sub-dial with a white hand circling around a snoozing Snoopy. There is also a polished black ceramic bezel ring with black varnished top cavity index markers in super-LumiNova plots, circling the dial. But, the dial has more to say, literally. Above inquisitive Snoopy hangs a typical comic book speech balloon that reads: “Failure is not an option.” This is a direct quote from the 1995 feature film “Apollo 13”, directed by Ron Howard. Also along the rim of the first 14 seconds of the dial can be read another quote from the Apollo 13 movie, which says: “What could you do in 14 seconds?” In reference to a course correction the Apollo 13 preformed in order to correct their trajectory and keep their space exploration on the right track, avoiding eerie incursions. Another interesting feature to the dial is the greenish glowing lume that emanates from the: hour markers, dial hands, tachymeter scale on the bezel, and even Snoopy will light up in a dark situation. Omega Speedmaster Apollo 13 Silver Snoopy Award Limited Edition iN the dark with it’s greenish glow. 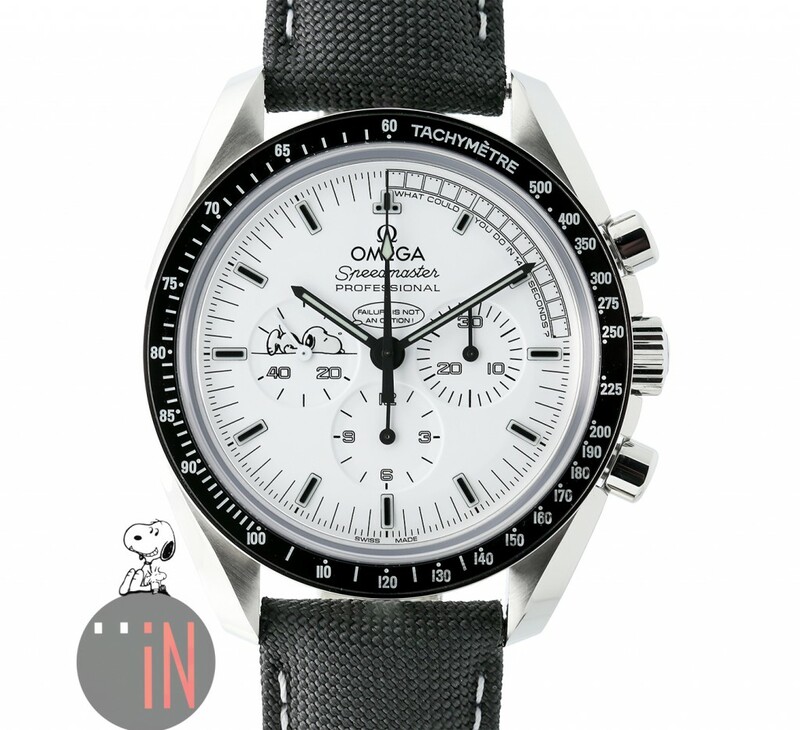 The “Omega Speedmaster Apollo 13 Silver Snoopy Award Limited Edition” is enclosed in a 42mm polished-brushed stainless steel case. 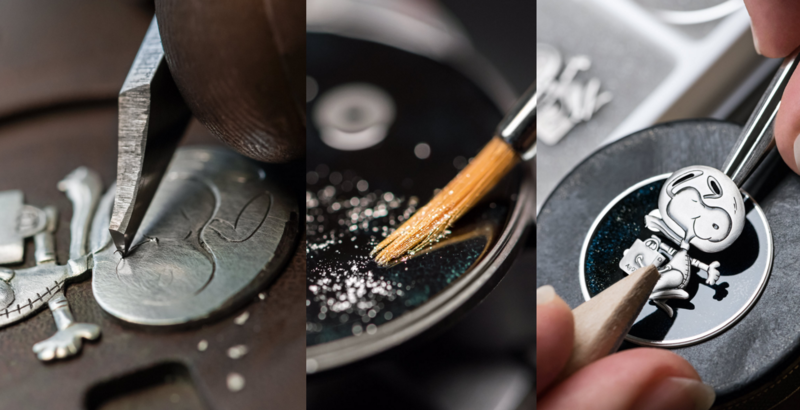 While the caseback exhibits a Snoopy design medallion (similar to the pin accompanied by the Silver Snoopy Award) rendered in 925 sterling silver, surrounded by dark blue enamel and protected by a domed sapphire crystal. It seems as if Snoopy is floating in space and adding to the uniqueness of each piece are the varied hand-applied silver flakes. The “Omega Speedmaster Apollo 13 Silver Snoopy Award Limited Edition” is powered by an Omega hand-wound chronograph movement, caliber 1861, with 18 jewels and a power reserve of up to 48 hours. This is the very same movement that powered the watches used for Apollo 13. The watch comes mounted to a nylon fabric strap instead of the more common stainless steel bracelet. 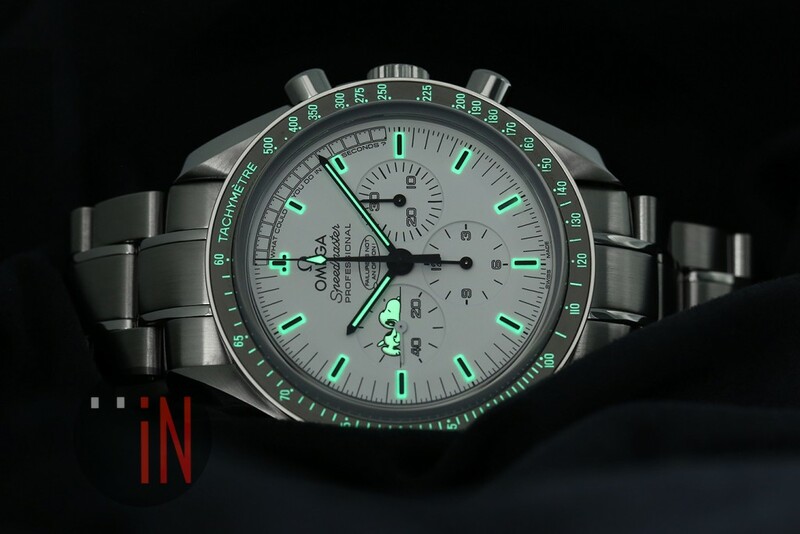 And though Omega has made various Speedmaster limited editions over the years, this one does manage to carve out a special place for its glow in the dark white dialed Snoopy. 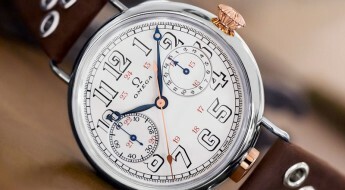 The production of this timepiece is limited to 1970 watches and they’ll probably sell-out at warp speed.